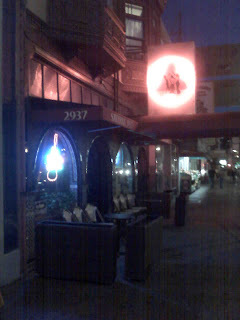 On a chilly and windy evening in San Francisco I found myself approaching Savanna Jazz’s awning thinking about the stark contrast between Club 26 Mix and what I expected to find at Savanna Jazz. In just a block’s distance I expected to encounter a relaxing loungey environment compared to the grungy weathered feel of 26 Mix. The outdoor seating in front of Savanna Jazz was empty which I attributed to the less than friendly weather. Savanna Jazz’s doors open at 6:30pm but it was a little after 7 when I strolled in. Upon arriving a nice, older gentleman asked me for the $5 cover charge which caught me a little off guard given that it was so early in the evening. Nonetheless, I dutifully paid for my ticket knowing that the proceeds would go to the musicians performing that evening. 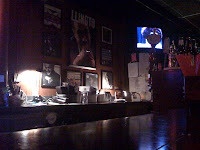 Upon entering I was immediately impressed with Savanna Jazz’s great ambiance and surprised by its emptiness. The dark walls were lined with portraits and album covers of Jazz greats—projecting a sense of honor and reverence to their talent and their craft. The long elegant bar with blue pendant lights radiated a soft illumination that reminded me of old New Orleans. Walking along the bar, the room opened up to booth seating and a dance floor, which also contained a handful of tables. In the back corner, a small stage hosted a piano, a set of drums and a space in between for the bassist. 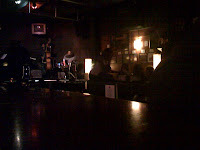 Though only established in November 2003, Savanna Jazz had the feel and character of an old San Francisco landmark. After ordering a Fat Tire and perusing the dinner menu I opted for some nachos to snack on. A video of Ella Fitzgerald’s "Jazz in Montreux '79 ‘St. Louis Blues’" performance played on the many TVs found throughout the room. Conversation with Howard and Allison, the bartenders, and with Makay, the hostess/waitress, was easy and comfortable. All were personable, friendly and welcoming. Shortly after I arrived, three musicians began setting up on the stage and soon after commenced their set performing only for me, the staff and a group of ladies in a corner booth. Having never played an instrument myself I was mesmerized by the trio’s talent, soul and passion which were expressed not only through their music but also through their body language. My “Swingin’ Nachos” arrived just in time to attack the hunger that had come over me. I haven’t had nachos that tasty in a long time—maybe ever!—and, it surprised me that of all the possible places to have the “best nachos in the Mission”, I was having them at Savanna Jazz! A few minutes later, Jeff, the chef, poked his head out from behind the kitchen curtain – to offer the bar staff a small sampling of his homemade salsa and chips as well as a hotdog bun stuffed with sausage. The bar staff was nice enough to share with me and despite their simplicity, this second batch of chips and the accompanying salsa were scrumptious—warm and homemade, the chips where crisp and flaky and the fresh salsa was almost reminiscent of an Italian bruschetta. Later in the evening, Jeff emerged from the kitchen to enjoy some music at the bar, and after few minutes of chatting with him, it was clear that he is a man that takes great pride in his culinary creations. As the evening crept towards midnight a few groups of late diners arrived claiming just a handful of seats but the place never filled up. The trio was generous with their music and talent, and it was truly a shame that the audience wasn’t larger to reciprocate their efforts. Driving down Mission St., I’ve passed Savanna Jazz countless times wondering each time for a few seconds what the place might be like inside. If it weren’t for Mission on Mission I am sure that I would have never discovered this San Francisco gem. 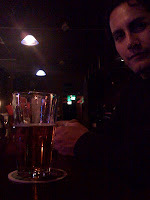 After a thoroughly enjoyable evening of fantastic jazz and hanging out with Jeff, Howard, Allison and Makay at the bar, I left the bar wanting to share my Savanna Jazz experience with my friends and fellow San Franciscans. My hope is that more people will discover Savanna Jazz and get to enjoy the good food, the friendly staff and harmoniously talented musicians. Whether it’s a Tuesday night jam session or a celebrated Jazz performer, what Savanna Jazz brings to the south Mission neighborhood and the City is a completely unique and inspiring experience. Amazing live music, grubbing food, a friendly staff, and parking … what more could a San Franciscan ask for?